Born 6 September 1814 in Saint-Antoine-sur-Richelieu, Quebec; died 20 May 1873 in London, England. George-Étienne Cartier’s early years passed as a self-described “rebel,” when he joined the Patriote cause in the Rebellion of 1837, including fighting at the Battle of St-Denis against British troops under command of Colonel Gore. He went into hiding in the United States and only returned to Montreal in 1838, following his successful petition that the treason charge against him be dropped. As a supporter of Sir Louis-Hippolyte Lafontaine, Cartier's early years in the Legislative Assembly saw the confirmation of responsible government in Canada, with the executive accountable to representatives of the people. Appointed to Cabinet in the mid-1850s, Cartier soon joined with Upper Canada Conservative leader John A. Macdonald in serving as co-premier in two successive governments from 1857-1862, the beginning of partnership that would last until Cartier’s death in 1873. Cartier was often one of the most powerful politicians in the Union legislature, commanding a united band of French-Canadian followers. Taking the lead role in the Cartier-Macdonald government in 1858, Cartier significantly endorsed as government policy federation of all the British North American provinces. A determined opponent of representation by population proposed by George Brown, which posed a threat to Lower Canada's language, laws and institutions, Cartier's change in policy signalled openness to constitutional change provided a new provincial government was secured for Lower Canada, ringed round with a federal division of powers. 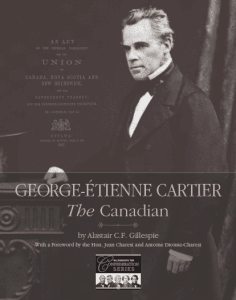 For more on Cartier refer to the Dictionary of Canadian Biography. The Macdonald-Laurier Institute is pleased to showcase the second paper of its Confederation Series, authored by MLI Munk Senior Fellow Alastair Gillespie.